Mac and cheese, Laurel and Hardy, Lupin and Tonks - some partnerships are just meant to be. 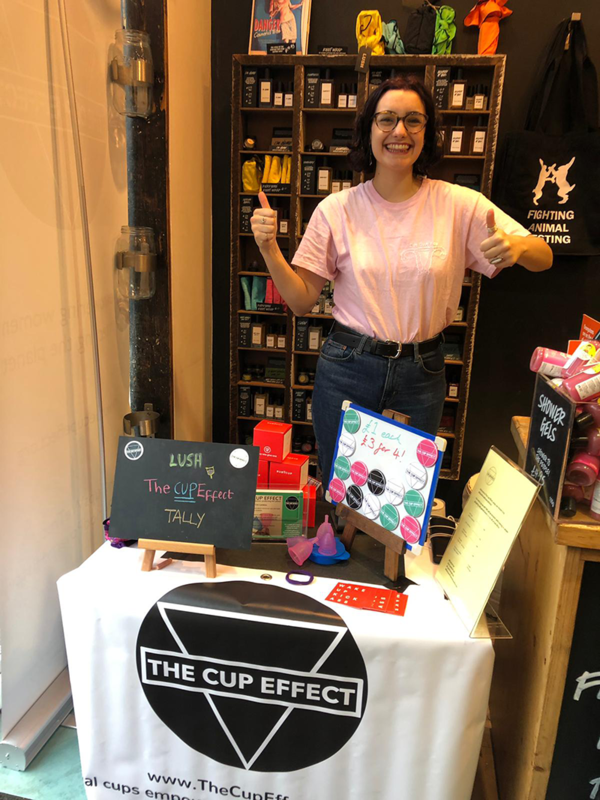 Which is why we at The Cup Effect were overjoyed at having the opportunity to buddy up with LUSH Cosmetics in Wimbledon for the first weekend in December. The Cup Effect and LUSH have oodles in common, from the love of feeling fresh as a daisy to working towards a zero-waste world. But the biggest thing both organisations strive for is a just, fair and equal society. So it was only a matter of time before we found the perfect chance to work together - LUSH’s Charity Pot Party. And this had a lot more to do with merely a love of receptacles… (Cups? Pots? Geddit? Okay.) What could be better than spreading our message alongside the bubbly, fizzy, creamy-soft staff of LUSH Wimbledon? 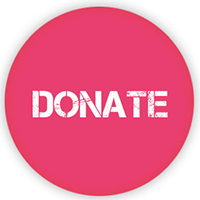 …the average woman will dispose of over 12,000 pads, tampons and other menstrual products over the course of her lifetime, creating over 150kg of waste – enough to fill two minibuses! 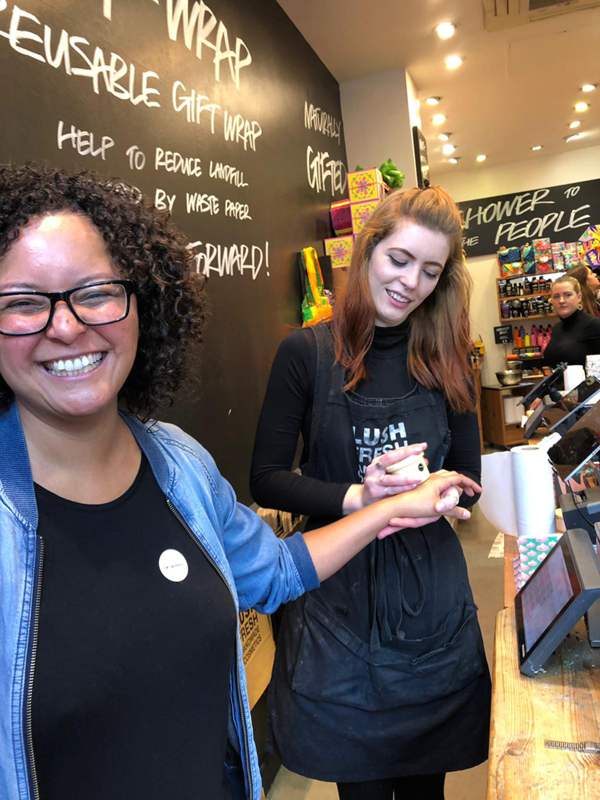 LUSH’s Charity Pot is a luxurious, indulgent-smelling pot (and bar in zero-waste form) of high-quality body lotion. 100% of the profits from the sale of any Charity Pot go straight to small grassroots organisations that fight for human rights, environmental conservation and animal welfare. The Cup Effect certainly fits that bill. 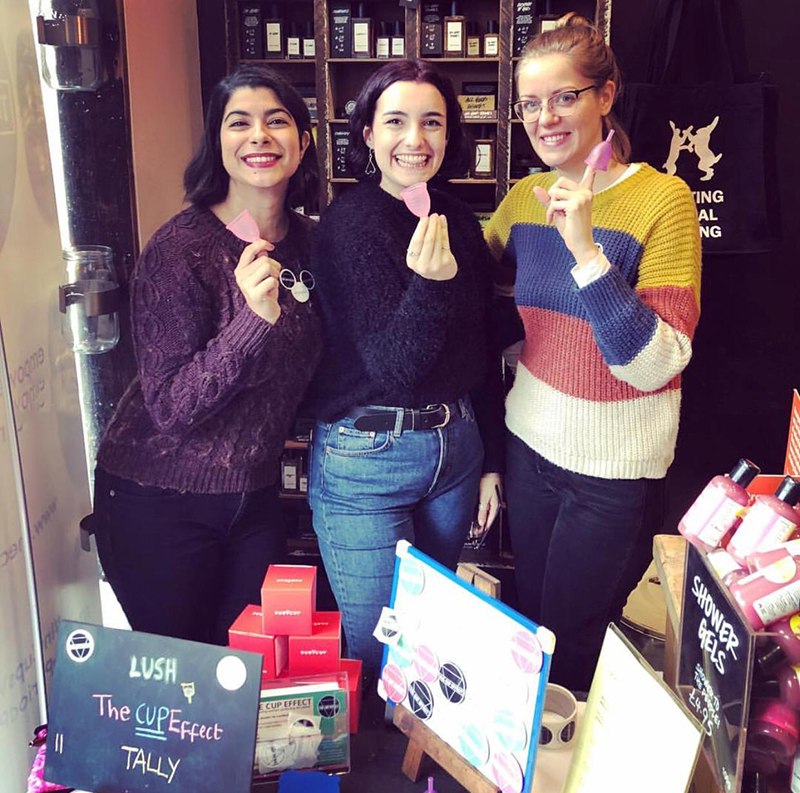 What’s more is that each LUSH store can choose their own charities to support across whole weekends, and this time, it was our turn! So off we trundled with our brand-spanking new roll-top banner, a suitcase full of menstrual cups and some shiny smiles to meet and greet the friendly people of Wimbledon out for a buzzing weekend of Christmas shopping. Our Founder Mandu Reid gives the Lush Charity Pot a try! The first people we met were of course the staff at LUSH. They gave us a very warm welcome and were super enthusiastic for our cause. The whole team worked tirelessly throughout the weekend to talk to customers about buying the Charity Pot and about The Cup Effect’s work. Since the lotion itself is almost irresistible, customers were more than happy to add a pot or two to their Christmas shopping, which meant that for each pot sold, The Cup Effect was raising money as well as ensuring that people’s skin was glowing! From the lotion? From giving to a worthy cause? Surely a resounding both! Some of the staff even sidled up to us at quiet moments to discuss using a menstrual cup. With our discount on cups especially for the staff that weekend, we managed to convert a couple of them and send them home with their very own cup, ready for a game-changing journey. 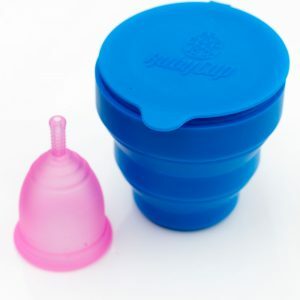 A menstrual cup is an ingenious alternative to pads, tampons, or other menstrual products. 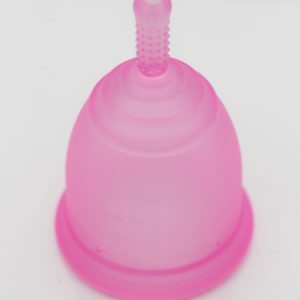 They are usually made of soft medical-grade silicone and, crucially, can be reused for up to 10 years saving the planet from unnecessary menstrual waste. It is inserted into your vaginal cavity and collects menstrual fluid, avoiding the usual vaginal drying associated with traditional menstrual products. 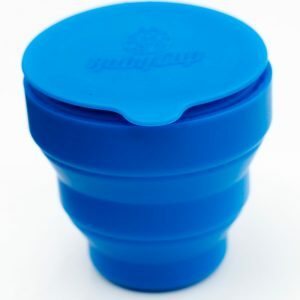 A cup can be used for up to 12 hours and allows for unrestricted freedom of movement – from swimming to running and plenty more! Not only were the staff stellar and so much fun to work with, we had some wonderful conversations with customers. One woman, a social media manager, was enjoying using reusable pads but felt that she was ready to graduate to a menstrual cup. After buying one with very little persuasion, she expertly promoted The Cup Effect on her Instagram story right then and there, which reached her 2,000 followers instantly. What a bloody babe! Another who decided to take the plunge buying a cup took some of our leaflets and said, “I think you’re brilliant. You’re doing such amazing work, keep going.” Well, if that doesn’t warm the cockles of your bath bomb-powdered nose when you’re standing for six hours next to an open shop door in December, I don’t know what will! Despite the cold weather, our enthusiasm didn't waver for even a second! Sometimes those of us involved in improving menstrual health get so comfy in our red bubble of liberation that we forget that periods are still a taboo subject. Many people from all walks of life get really nervous when you mention the mighty blob and it’s important for us to remember that, on the whole, the general public’s response to menstruation varies widely but that it is constantly changing, and we’re a big part of that change. We hope that by starting small conversations such as these, the public will feel encouraged to empower themselves through education and take back control of their periods. In short, they will discover the choice that women and period-age girls have available to them. Nevertheless, we came away with a rejuvenated sense of purpose for The Cup Effect – to shout even louder about what we do! And the results of that awesome weekend are in, so let’s crunch a few numbers: thanks to the LUSH Wimbledon staff and the Charity Pot Party Weekend, we raised over £220. With these funds, 22 people will benefit. Not only that, the menstrual cups we sold over the course of the weekend will benefit a further eight women and girls through our buy one give two policy. That’s 30 people benefitting, and since each menstrual cup lasts for ten years – that’s a combined 300 years of empowerment! That also saves the environment tons of single-use menstrual products going into landfill. Fabulous or what?! As I like to say… I guess that’s just The Cup Effect. Shiraz Engineer wears many hats as a Cup Effect volunteer but focuses mainly on events. 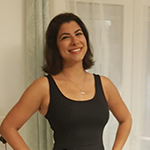 She works at Girlguiding UK on a diversity project helping to get more girls and young women from deprived areas into guiding. Shiraz also adjudicates schools debating competitions and once judged Malala Yousafzai in a debate!